Here’s how to paint your red brick fireplace in three easy steps. 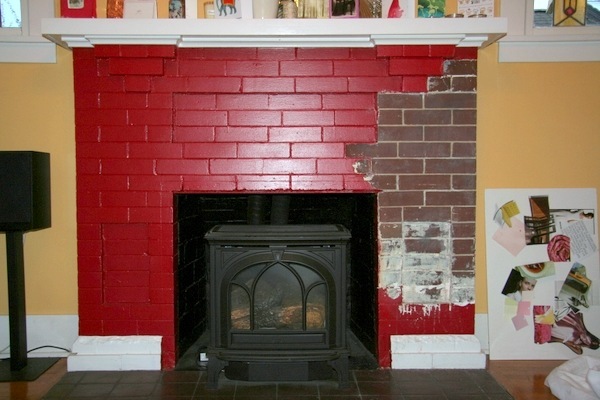 Painting your red brick fireplace can usually be done in one afternoon. Try these simple steps for DIY fireplace painting. If you’re considering some DIY fireplace painting ideas, there are plenty of choices out there. From whitewashing to faux painting a brick fireplace, you’ll need to decide what look you’re trying to achieve. Check our article, Should I paint My Brick Fireplace to help you with that decision! See these steps if you decide to paint your fireplace one solid color. Lay down a drop cloth to protect your floor before you begin your project and put on your safety goggles. In order to make sure your paint adheres to the brick’s surface, you’ll need to clean the brick before you begin painting. First use a small brush broom to brush off the brick and remove any dust, dirt or loose mortar. Next, you can use a scrub brush and a bucket of soap and water and/or some brick and stone cleaner to remove any soot or grime from your bricks. If your fireplace brick is especially dirty, you can use a wire scrub brush and TSP (trisodium phosphate) and then use your cleaner. Rinse your brick thoroughly. Tape off the area around the edge of your bricks so the surrounding area will remain paint-free. Apply the oil-based primer using your large brush, covering all the brick and mortar. You can use a roller or a brush for this step. Use the small brush to get into crevices and corner areas. This primer will help protect your painted brick from soot stains when you burn real wood. Rinse your brushes and wait for the primer to dry. Now you’re ready to begin the last step of your project. You might have chosen either flat, semi-gloss,or gloss heat resistant indoor latex paint. Apply the latex paint covering all the the brick and mortar using either your large brush or roller and your small brush for crevices and hard to reach spots. You might want to use your roller on this step if your brick is rough or textured. You can apply a second or third coat of paint, letting each coat dry before applying the next. Remember, this type latex paint is not for use inside the firebox, the area where you build a fire. A special high temperature paint is required for that area that withstands temperatures up to 1200 degrees Fahrenheit without chipping, blistering, or peeling. Now stand back and admire your work! Painting your red brick fireplace gives the old outdated brick a facelift and gives your room a fresh clean look.